Andrew Ross Sorkin is a columnist for The New York Times and a co-anchor of Squawk Box, CNBC’s signature morning program. He is also the founder and editor-at-large of DealBook, an online daily financial report published by The Times that he started in 2001. Sorkin is the author of “Too Big to Fail: How Wall Street and Washington Fought to Save the Financial System — and Themselves” (Viking, 2009), which chronicled the events of the 2008 financial crisis. The book won the 2010 Gerald Loeb Award for Best Business Book, and was shortlisted for the 2010 Samuel Johnson Prize and the 2010 Financial Times Business Book of the Year Award. The book spent more than six months on The New York Times Best Seller list in hardcover and paperback. The book was adapted as a movie for HBO Films in 2011. Sorkin was a co-producer of the film, which was nominated for 11 Emmy Awards. Sorkin is also co-creator of the drama series “Billions” on Showtime starring Paul Giamatti and Damien Lewis. 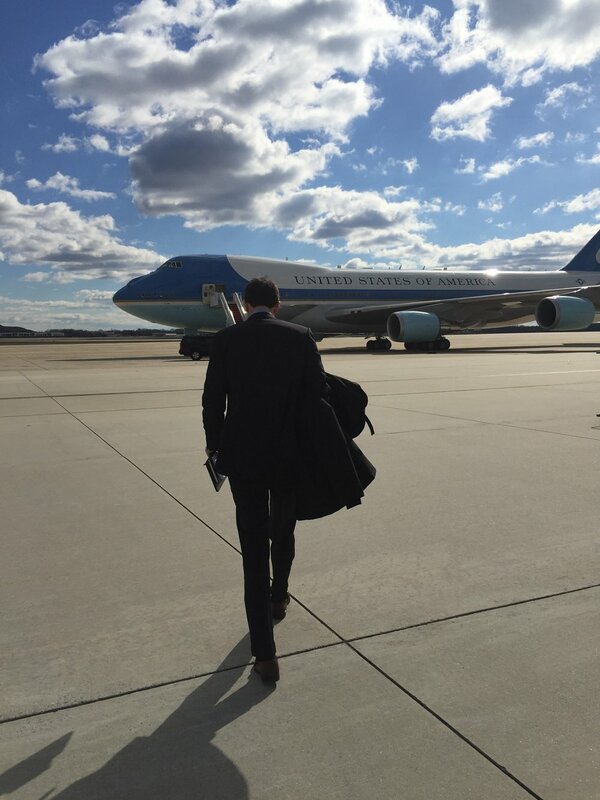 Andrew walking to Air Force One to interview President Obama in 2016. Over the years, Sorkin has broken news of many major mergers and acquisitions in the pages of The Times and has been at the forefront of Wall Street news. He reported extensively on the financial crisis of 2008, its aftermath on Wall Street and the government bailout of major investment banks, with coverage including the collapse of Bear Stearns and Lehman Brothers, and the A.I.G. bailout. He has broken news of deals including Chase’s acquisition of J.P. Morgan and Hewlett-Packard’s acquisition of Compaq. He also led The Times’s coverage of Vodafone’s $183 billion hostile bid for Mannesmann, resulting in the world’s largest takeover ever. As a leading voice about Wall Street and corporate America, Sorkin is a frequent guest on national television and radio programs, as well as a lecturer at universities across the country. He has appeared on NBC’s “Today Show,” PBS’s “NewsHour,” HBO' "Real Time with Bill Maher," NPR’s “Talk of the Nation,” and many others. He won a Gerald Loeb Award in 2004 for breaking the news of I.B.M.’s historic sale of its PC business to Lenovo. He was also a finalist in the commentary category for his DealBook column. He also won a Society of American Business Editors and Writers Award for breaking news in 2005 and again in 2006. In 2007, the World Economic Forum named him a Young Global Leader.